SUMMARY: Seventeen-year-old Evie O’Neill is sent to live with her bachelor uncle in New York, after her secret gift of reading information from objects gets her in trouble in Ohio. She helps her uncle in running his Museum of American Folklore, Superstition, and the Occult – also known around town as the Museum of the Creepy Crawlies, and enjoys the city party-scene. When a series of grisly, occult-themed murders begins occurring around the city, Evie’s uncle is consulted to help the police figure out what is going on, and Evie begs to be allowed to come along and help, too. Set in the “roaring twenties”, the story gives a glimpse into the time period, including flappers, funny slang, speakeasies, great music, and booze. OUR GROUP REVIEW: Kellie Hall did a great job on the book presentation and moderating the discussion. 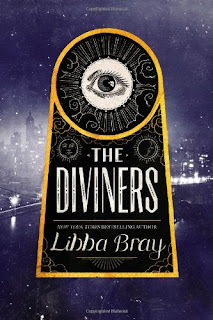 She showed us the website for the series, http://thedivinersseries.com, which has many fun features including a trailer, descriptions of all the characters, information about the author, videos, and “diviners radio” – the music playlist Libba listened to while writing the book. We watched an episode of “Supernatural Travels with Libba Bray”, which was a video she made where she shows places in New York that inspired certain locations in the book. A few of the book club members had met Libba Bray, and said she was a hoot. 1. Was this book scary to you? We decided this was the creepiest book club book so far, and would have been perfect for an October pick if we had known! Many people said they couldn't read this one at night before bed. The creepiness/scariness of the book was an interesting juxtaposition to Evie's bubbly personality. 2. Who was your favorite character? Most people replied Theta and Henry right away - they liked their personalities, and their friendship. Sam and Evie were also fun characters. 3. Did you like the multiple narratives? Yes, it was fun to get the multiple back stories, and learn different characters' secrets, which wouldn't have worked as well with a single-view narrative. These tangents broke up the action a little bit, and made the flow seem "haulty" to some. 4. Who do you think Evie will end up with? Most people thought Sam, but that she will be with Jericho for a while because she feels bad for him, and that he is a ticking time bomb and may malfunction at any time. 5. Do you think it was too satanic? Most said no. 6. Did you like how she incorporated Memphis and Isaiah into the story? It felt a little segregated, they had more of a separate story line, but it was tied in a little to the others at the very end. 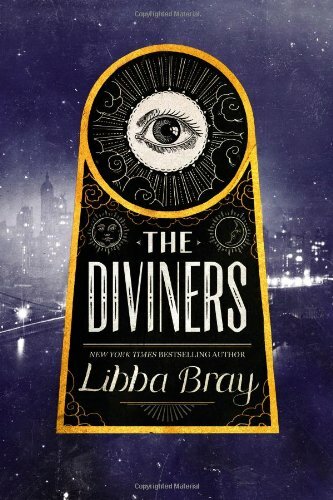 Many people said that they expected all of the Diviners to get together before the end of the book, but they didn't. This is probably something that will take place in future books in the series. 7. "The Second Great Awakening" which happened from 1800-1830, in which there was a fever of spiritualism. The LDS Church, and other churches that were formed in that time period were mentioned in the book. 8. "Fitter Families for Future Firesides" -(Eugenics) were encountered when Evie was at the fair. Only 4% of all Americans fit into their category to be fit for leadership. In the book, were these people also looking for Diviners? 9. Many superstitions were featured in the book: Isaiah holding his breath while passing the cemetery, voodoo, tarot, ouija boards, etc. 10. What do you think James is trying to tell Evie in her dreams? Maybe something to do with "Project Buffalo", was he an automaton? John Hobbes tells Evie that there is something she doesn't know about her brother. Was he bluffing to taunt her, or did he know? She had seen John playing checkers with James in her dream/fever state. Do the diviner gifts run in families? 11. Will says love is equally as dangerous as hate. Do you believe that? We talked about people that stay around and haunt - that may push people to do things that they otherwise wouldn't do to help them. It is easier to justify doing something awful if it is to help someone you love. Those that love someone have a harder time letting go and moving on. 12. What do you think Project Buffalo is? Do you think Sam's mother is still alive? Will, Will's fiance, Sister Walker and Marlow the billionaire guy were in on a secret thing from the government. What does Will know that he is not sharing? Sam saw papers on Will's desk. We think that Sam's mother is still alive somewhere. 13. Who is the gray man in the stovepipe hat? He appears in the dream-landscape. He seems like he is the guy in charge, and is always there. Naughty John's father killed himself years earlier, could it be him? When John is being sucked into the pendant, he tells Evie that she doesn't know what she has released. Evil is often started by people thinking they are doing the right thing, and it morphs over time. 14. Blind Bill - How is he involved? Maybe he was part of Project Buffalo? What power did he used to have? Was he able to see the future? He was able to take energy/power from Isaiah. 15. When the old ladies talk about Evie - "What a terrible choice to have to make", what are they talking about? This doesn't seem clear right now, and will probably play into future books. 16. Dreams - people can go to the same "dreamscape". Do the diviners feel a "pull" toward one another? VIOLENCE: Heavy - This is a book about occult murders. Most of the violent acts take place "off screen", but the aftermath is described in detail. PERFECT review Jenny, this is wonderful, thank you for doing it! !